Goodreads Summary: Walter Dean Myers calls to life the deep, rich, and hope-filled history of Harlem, this crucible of American culture. Christopher Myers’ boldly assembled collage art resonates with feeling, and tells a tale all its own. Words and pictures together connect readers -of all ages – to the spirit of Harlem in its music, art, literature, and everyday life, and to how it has helped shape us as a people. My Review & Teacher’s Tools For Navigation: After reading this book the first time, I knew I was going to have to tackle it differently than just reading a picture book. I wanted to make sense of it and I knew that I didn’t have the background knowledge so I knew that the power of all of the words had not sunk in yet. So, I typed up the poem in Google Drive and began doing my very own close reading of the poem. I started with research of terms and names that I didn’t know, building my knowledge of the culture and history of Harlem. Through this build up of knowledge, I began to understand the beauty behind Myers’s poem. The voice of this poem is one of heartbreak, but strength; proud of not only what he has become, but where he came from. This poem is a celebration of the history of Harlem and its citizens—a celebration of its religion, music, poets, authors, and everything that made/makes it a hub for the civil rights movement and African America culture. While doing my research, I found an amazing website that I will definitely use when teaching this poetry book- Harlem: A Visual Interpretative Analysis– which takes an excerpt of the poem and an accompanied collage and takes the reader through an analysis of the excerpt and artwork. Fascinating! This book would be a great one to use across many different subject areas- history, literature, and art. 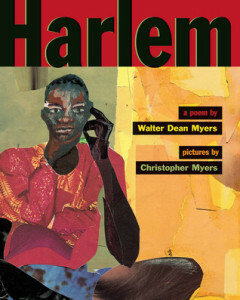 Discussion Questions: What references to Harlem’s history did Myers entertwine into his poem? ; How did Christopher Myers’s illustrations take the poem to another level? ; (Writing) Do research about your ancestors and your heritage. Through this research, find people, places, literature, art, musicians, etc. that helped shape who you or your family are. Use this research to construct a poem about your heritage. Find a piece of artwork to accompany your poem. I’ve seen, but still haven’t got my hands on it, Kellee. It sounds wonderful. When I took my students to NYC a few years ago, we visited Harlem, had studied the migration from the south-awesome experience! I wish I had had this book then. Thanks to for the link! I’ve loved this book for many years. I always had at least two copies of it in my classroom. I loved the poem you chose to share above. It makes the subway seem just so beautiful (even when it doesn’t feel like it’s a wonderful place to be). My classroom copy disappeared–I need to replenish because it is such a powerful piece of text! I love your review! This sounds like an amazing book. Would you be interested in linking up this post to the Diverse Children’s Books Link-up? You can find it at http://pagesandmargins.wordpress.com/2016/04/16/diverse-childrens-books-link-up/. Thanks! Thank you, Beth 🙂 We made a list of posts to share on the Diverse Link Up, and this is one of them 🙂 I’m so glad you liked the review! Terrific review. I spent last year living in Harlem and it actually became my favorite New York borough. Walter Dean Myers is well loved there. Such a huge fan of Walter Dean Myers, love this review!